After finally bowing to the kind and well-meant pressure of family and friends, I am now ready to try selling my handmade jewelry online. I know it’s necessary to promote my products and my store. How else can I possibly be found amongst the many many handcrafted jewelry makers in the world?I’m not what you would call internet-friendly, and at this point I haven’t a clue how to go about this. I am willing to learn, but I will need a set of built-in tools that I can work with right away. iCraft, found at icraftgifts.com has a set of promotional tools that will help even the most new and innocent to the world of online marketing and social media. Who knew that the internet could be so powerful in getting out a message? Each store on iCraft has an RSS feed that allows people to subscribe to store updates, and links for sharing your products on social media sites. 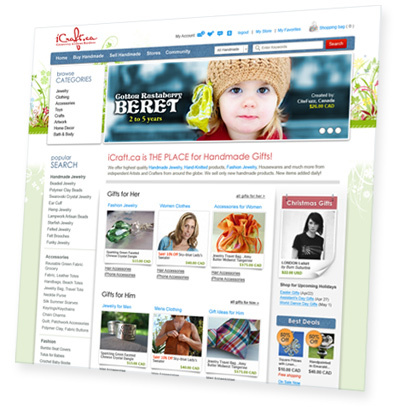 iCraft displays your products on theFind.com, giving them exposure to close to 40 million shoppers every month. Each store on iCraft has a unique URL that you can use for offline promotions, and link to from other websites. You can create a promotional widget for your shop to place on your personal blog or site. This tool allows you to showcase the products you posted on iCraft. iCraft store and product pages are continuously reviewed for SEO (yesterday I didn’t even know what this stood for). Among other aspects of their stores, sellers are encouraged to work on titles and product descriptions that will ensure the best results in getting found in the universe of the internet. iCraft sends out monthly, themed newsletters to buyers and subscribers, featuring seller’s products. iCraft also sends out a regular email updates for sellers with shops on the site. This email contains news and updates about the site and tips to make your store the best online shopping experience possible. Each seller on iCraft can post to Blog Central (all posts are moderated to ensure quality content. Blog posts by sellers are connected to their shops, so buyers can get product updates and learn more about you and your artisanal processes through your blog. iCraft has all the tools I need to set up and promote my new online handmade jewelry store. I find the interface is easy to work with and the explanations of how to access the tools and use them to customize your shop are clear and helpful. You have support and knowledge behind you as you get the word out about your beautiful items. I can heartily recommend iCraft to all independent artisans interested in selling handmade jewelry in an online marketplace that works with you to help make you successful. To begin the journey towards selling your artisanal crafts in a marketplace dedicated to handmade, click here. I am professional content writer and internet marketer.